Brian May left a promising career in science to try his hand at rock 'n' roll, and did OK enough, we guess, becoming a co-founder of the band Queen. (That makes him the only Ph.D. astrophysicist in the Rock and Roll Hall of Fame.) What's more, he's also deeply into 3D stereoscopic photography, and has just published a new book of pictures of his band. Given his success with Queen, we made him answer three trivia questions about Dairy Queen, the ice cream and fast food franchise. And now the game where we reward a lifetime of achievement with a few moments of trivia. It's called Not My Job. 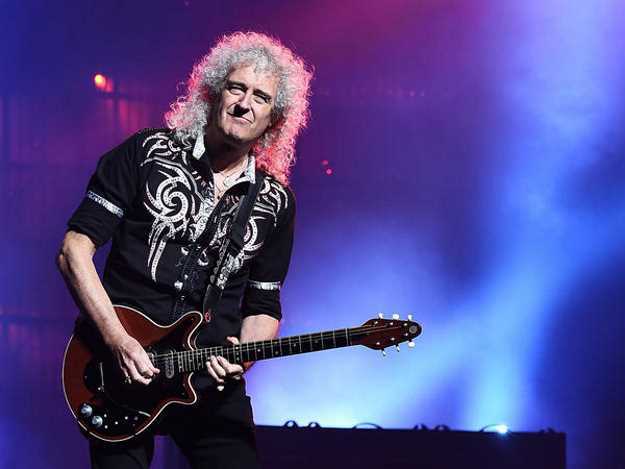 Brian May left a promising career in science to try his hand at rock 'n' roll. And he did OK. He founded the band Queen with Freddie Mercury, John Deacon and Roger Taylor, making him, as far as we know, the only Ph.D. astrophysicist in the Rock and Roll Hall of Fame. But he had another enthusiasm, 3-D stereoscopic photography. He's published a new book of pictures of his band so realistic you can practically smell the groupies. SAGAL: Brian May, welcome to WAIT WAIT... DON'T TELL ME. BRIAN MAY: Thank you very much. SAGAL: ...Enjoying these 3-D pictures of your band and its history and Freddie Mercury and your other friends and musicians. And I have one thing to ask you. How is it that in all the years that you've been in the public eye, your hair has never changed? MAY: Yeah, they do it all the time. MAY: I have a good answer for that. But it's probably not repeatable on your program. SAGAL: So there are so many things that are interesting about you. You were, as I said - you were pursuing your doctorate in science when the band started, right? MAY: I was, yeah. In astronomy. In what they now call astrophysics, yeah. And I gave it up. And I thought I was actually doing astrophysics a favor by choosing the other option. MAY: Yeah. And I also thought, you know, there's a window opening here. And if I don't kind of walk through - or a door opening, I should say. And I thought, if I don't walk through right now, that door will never open again. So I went off and, against all the odds, became a rock star for some reason. SAGAL: Yeah. That seemed to have worked out pretty well for you. MAY: It's OK. It's been OK so far. Yeah. PAULA POUNDSTONE: So wait, you're suggesting that you were not a good astrophysicist? MAY: You know, I didn't think I was. POUNDSTONE: What would make a bad astrophysicist? MAY: Well, what would make a bad astrophysicist would be, like, not being able to complete your Ph.D., which is what happened. MAY: And I couldn't please my supervisor. So 30 years later, I found myself with another supervisor. And he liked what I did. So I kind of updated my vision of myself. But I got it after 30 years. SAGAL: Wait a minute. What I love is that you going in to get your Ph.D. not as young Brian May but as Brian May the guitarist of Queen. SAGAL: I mean, did you - like, your oral exams - did you come in and say, I could answer your questions, or I could just do the riff from "We Will Rock You." MAY: Well, you know, they were tough on me. I think they had to be because they couldn't be seen to kind of make it easy for me, you know? And, you know, I got a whole sheaf of stuff that I had to do in order to finish it off. BURBANK: ...But this panel thinks otherwise. Do they do anything corny like that? SAGAL: You were always into 3-D photography. SAGAL: I'm just trying to imagine though that - it must have been like the mid-70s in the absolute apogee of, like, the rock 'n' roll lifestyle. And there's the cocaine. And there are the groupies. And there's the liquor. And you're, like, trying to get everybody to hold still so you can take a 3-D photograph. SAGAL: Guys, guys. Come on. MAY: I'm not going to contradict you there. MAY: Should we just move on? SAGAL: All right. I will. POUNDSTONE: Every high school student has the same story, I imagine, on the way to sports events. POUNDSTONE: Like, when I played lacrosse in high school, we would bang our sticks on the roof of the bus. POUNDSTONE: How this driver tolerated it I'll never know. And we would scream at the top of our lungs the lyrics to, you know, "We Are The Champions." POUNDSTONE: And it was so much fun. BURBANK: Did you guys ever win a match? MAY: It did you no good whatsoever. BURBANK: What would you sing on the drive back, "Another One Bites The Dust?" BURBANK: Can I just ask what - like, in the creation of an amazing, iconic song like "Bohemian Rhapsody," did Freddie Mercury write those lyrics? BURBANK: And, like, what was it like when he says, OK, these are going to be the words to this song? BURBANK: So no one looked at him when he started singing scaramouche? MAY: You know, we were enjoying ourselves. SAGAL: Can you do the fandango? MAY: I mean, this stuff is really fun to do in the studio. MAY: And nobody had ever done it before, you know? SAGAL: Oh, absolutely. I'd never heard anything like that in my life when that song came out. MAY: Well, and you won't again. SAGAL: I know. I know. POUNDSTONE: So you guys just, you know, scaramouche, scarmouche, not even looking at one another? POUNDSTONE: It does sound like fun. SAGAL: Last question - as an astrophysicist, because this is interesting how you both - do both - can you scientific explain how it is that fat bottomed girls make the world go round? MAY: Yeah. I think that's still true. I was just lucky to find out early, you know? BILL KURTIS: Have a peanut buster parfait. SAGAL: You, of course, as we have been discussing, are one of the founders of Queen, one of the iconic rock bands of all time. So we thought we'd ask you three questions about Dairy Queen. SAGAL: Dairy Queen. You might have come across it in your travels across America. It's a popular ice cream and fast food franchise. MAY: This is the bit I've been looking forward to so much. SAGAL: Answer two questions about - by the way, I should say that absolute ignorance is always an advantage in this particular game. MAY: Well, you've got it in this case. ADAM BURKE: I'm just picturing the Queen tour bus pull up to a Dairy Queen. SAGAL: It'd be the greatest day of those people's lives. BURKE: Freddie just marching in. Blizzards for the lot of us. MAY: Can I go home now? SAGAL: This is already going very well. SAGAL: So the question, though, for Bill is who is legendary guitarist and astrophysicist Brian May playing for? KURTIS: Ella Jones of Baltimore, Md. SAGAL: Just two right, and we win it all. None right - who cares? Here we go. Dairy Queen has given us so much by way of frozen treats, the Blizzard, the Dilly Bar, the Oreo Brownie Earthquake. But it's also responsible for what other wonderful thing? A, the defibrillator device; B - the band No Doubt, or C avocado toast? MAY: I would say none of the above. But I have no idea. The defibrillator. I'm going for the defibrillator. SAGAL: ...Because it turns out that Gwen Stefani and two of her band mates met and formed their band at a Dairy Queen in Anaheim, Calif., when they both - all worked there. MAY: I'm on the edge of my seat. SAGAL: ...Or C, the heck-of-a-job brownie? MAY: I'm going to go for number one. SAGAL: The flaming sundae. You're right. SAGAL: He invented a flaming sundae, a sugar cube doused with liquor - set it on fire. Very attractive. So your last question. If you get this right you win, which I'm sure will go well with your CBE. SAGAL: Last question. Dairy Queen has a deep, dark secret - something they would rather that you - none of us - would know. What is it? A, their original name was Dairy Fairy; B, their ice cream isn't actually ice cream or C, the chain is wholly owned by the government of Iran? BURBANK: He's operating at a slight disadvantage having never been to a Dairy Queen. SAGAL: It's true that their product - their frozen soft serve cannot be legally called ice cream because it doesn't have enough real cream in it. SAGAL: Bill, how did Brian May do on our quiz? KURTIS: He is a champion. KURTIS: Two out of three. SAGAL: In just a minute, Bill reads our limericks in their original Irish. Call 1-888-WAITWAIT to join us on the air. We'll be back in a minute with more of WAIT WAIT... DON'T TELL ME from NPR. Transcript provided by NPR, Copyright NPR.